Tina Roth Eisenberg never intended to run multiple startups simultaneously. In fact, those startups were never meant to be businesses at all. You probably know Tina best as Swiss Miss, the name of her wildly popular design blog, which began as a personal online archive well before averaging over a million unique monthly visitors. It’s one of a few side projects or “labors of love”, as Tina calls them, that grew into full-time gigs. Those include TeuxDeux, a very simple to-do app; the breakfast lecture series Creative Mornings, which now has more than 160 chapters around the world; FRIENDS, a co-working space in Brooklyn; and Tattly, a designer-driven temporary tattoo company. Tina joined me on the podcast to share her tips for juggling multiple projects, where she found the greatest learning curve as a designer turned startup founder, the role community can play in inspiring great work, and much more. If you like what you hear, check out more episodes of our podcast. You can subscribe on iTunes or grab the RSS feed. The common link between Tina’s many successful projects – solutions to a personal pain point. If you’re going to complain about, then try fixing it. Tina’s biggest lesson learned in the past year: Any founder, regardless of background or industry, must get a handle on and appreciation for sales in order to succeed. Silos put a ceiling on any startup. Surround yourself with a diverse group of people that have high standards in their work and complement your own skills. If you’re a founder that cannot dedicate 100% of your time to one company, you have to hire people that are very self-driven and take initiative when you’re tending to competing responsibilities. Stewart Scott-Curran: Tina, welcome to the show. Incidentally, you’re the only person I know who has an emergency drawer of confetti. Tina Roth Eisenberg: I’m a big believer in having a confetti drawer, yes. Every business should have one. It always puts a smile on people’s faces when you open the drawer and it’s just jam-packed with confetti. Stewart: You’re juggling a lot of projects and have been doing so for a while. How did these “labors of love”, as you call them, become full, and perhaps unintentional, businesses? Tina: I grew up in Switzerland and trained as a graphic designer. When I was 26 I graduated and moved to New York for what was supposed to be a three-month internship. I fell completely in love with the city. I worked for quite a few years as a designer at various design studios and specialized in interactive and user interface design. When my daughter was born,I had this moment of, “I really should follow my dreams,” and I always wanted a design studio. I started my own design studio and I had very cool clients right away, and then very quickly realized that I didn’t want to work from home. Quickly after I started my design studio, I started a co-working space before co-working spaces were a thing. It has completely changed my life and has been the best decision I’ve ever made, because if you surround yourself with really smart and creative people, you raise the bar. Out of that co-working space, while I ran my own design studio, I started these “labors of love”, little side projects. They have organically turned into businesses. For example, I started a to-do app with my studio mate Cameron Koczon over a lunch conversation. I basically lamented the state of to-do apps and how they have too many bells and whistles. I just wanted something simple. I designed it, and two days later, he built it, and then we had TeuxDeux, a very simple to-do app, which has actually turned into a small side business. Then I started a temporary tattoo business called Tattly, which was really began as just a joke. Now we have 17 people working on the team and we ship tattoos all around the world, which we license from artists and designers. TeuxDeux was born out of a shared disdain for overdone to-do apps. Creative Mornings, which is a breakfast lecture series, began by simply opening the doors to my design studio and letting the larger creative community come in. That has organically grown over the past eight years to include 160 cities around the world. I have this knack of seeing a need for something, or something that I want to fix, and I do it out of sheer love for the process, because I want it to exist in the world. Then the world screams at me and basically says, this should be a business and needs to grow. I need to stop starting things. It’s like with shoes. If a new pair of shoes comes in, one needs to go, and I have a lot of ideas for starting new things, but I’m not allowed to because something else would have to get off my plate first. Stewart: There’s a common link between all of those endeavors: you’ve spotted a problem and then created something you think solves it. I remember you saying that if you complain about something more than two times then you feel a responsibility to do something about it. 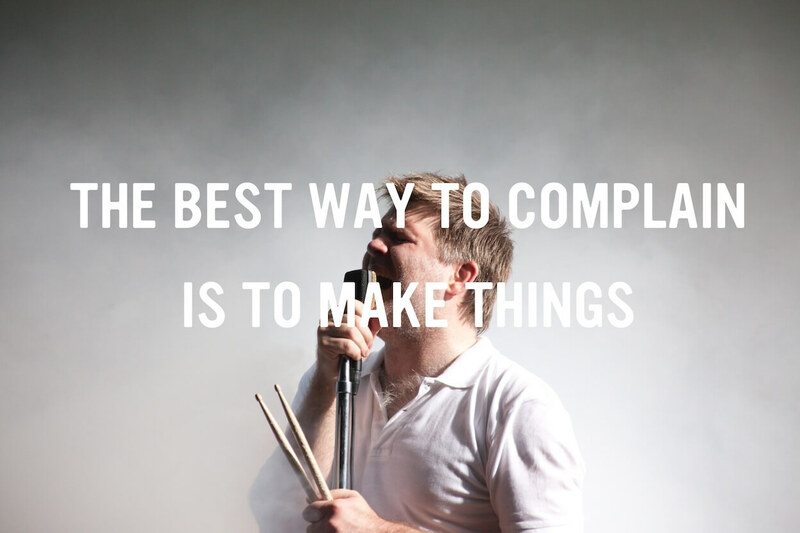 This quote from musician James Murphy has long been a source of inspiration for Tina’s ideas. Tina: That’s my personal rule. It drives me crazy because complaining is a real waste of energy. If I catch myself complaining repeatedly about something, I have two options: do something about it or let it go. For example, Tattly, the temporary tattoo company I started, was literally because I would complain about the state of temporary tattoos and how hideous the designs were that my daughter would bring home from birthday parties. At one point, I thought, “Tina, you need to make a decision, either stop complaining or make it better.” So I did. Stewart: Tattly is a business that’s focused on sales, whereas Creative Mornings is something fairly different – it’s a more altruistic, localized system that’s self-sustainable and not focused on profit. Where’s the tension between those? How does running those two things differ and what lessons have you learned through doing both of those at the same time? Tina: This is the thing I had been thinking about in 2016. First of all, I never set out to run two companies at the same time. I’m often like, “What in the world was I thinking?” At Creative Mornings, the only measurements we have to me are how much do we grow around the world, how many people attend, and how much goodness and happiness does it bring. It’s a volunteer-driven organization, and we have over 1,500 volunteers around the world. Then there’s Tattly, which at the end of the day a sales-driven company, and I am not a salesperson at heart. There is a lot of tension in that because I had to learn and embrace sales as an art form last year. I’m someone who loves to build the machine and figure out how the machine works, but I really didn’t care about the sales dial was set on it, if it’s on six or 12 – and I had to start caring. When you’re a sales-driven company, at the end of the day, even if you sell artistic things, you need to care about your margins and the sales channels. Everyone can start learning to become a more sales-driven person. I sometimes laugh because now here I am, sitting, looking at Excel spreadsheets and talking and worrying about margins. How have I become that person? There’s been a lot of personal growth, but I do also realize that when you run two companies that are so different, like a sales company versus Creative Mornings, the people you attract are so different. The people that end up running these companies are very different people, and I can experience this firsthand because I run them simultaneously, and these people are all in the same room. It’s incredibly fascinating. I would’ve never guessed, even though I’m the same person running both and I have the same set of values, that it ends up being a completely different organism with different kind of people in it. One day I might have to write a book about it. Short answer is that in my hearts of hearts, I’m not a salesperson, but everyone can embrace it and start learning to become a more sales-driven person. That was my lesson of 2016. Anyone out there who thinks, “I can’t sell”, or “this is not my thing”, everyone can learn it. I can give some lessons now. Stewart: At the same time, you still bring a huge sense of fun to that work. I’ve seen you doing the trade show stuff, but then you also had your little pop-up shop in Brooklyn. Tina: I had to bring in my own version of selling, so that it’s not crushing my soul. I do it with a whole lot of humor and I embrace the silly in the whole thing. That’s another thing I had to learn. If running companies has taught me one thing, there is not one way of doing something. As someone who started a retail e-commerce business with Tattly, not knowing anything about any of it, there’s such beauty in being a complete novice in a certain industry because you come in and you basically question things that other people would never even question. I knew nothing about trade shows, I knew nothing about wholesale accounts, I just knew nothing. I never thought about margins up until a year and a half ago when I hired a real salesperson and she’s says, “let’s look at your margins”. It’s incredibly refreshing when you start a business with such innocence and enthusiasm like I did and then automatically bring a breath of fresh air to an industry that others would never even dare to do. Stewart: Community is a very important part of your life philosophy and career, whether it’s stuff like Creative Mornings or a co-working space like Friends Work Here. What can fellow creators and entrepreneurs learn from folks in industries and disciplines outside their own? Tina: If I look at my career and my life, I just, I always had this desire to get people together. When I was in high school, I ran the student council and organized events, so that was in my DNA. Now, in a more professional setting, I wasn’t kidding when I said that I started my first iteration of my co-working space nine years ago, Studiomates, the moment I realized that (you benefit) when you surround yourself with people that are equally driven, creative, but from different industries. I sat next to a developer and behind me was an illustrator and a writer. We all had our different crafts that we were really good at. Because up until then, I felt like we were always in our silos. I would only go to graphic designer events, and the information architects would only hang out together, but when you sit together and you can turn around and I can ask a photographer for advice or the guy who’s just running a startup next to me, there’s such incredible value and magic that happens. I always tell everyone that is starting out to find that group of people that has really high standards in their work and that complement you in some way. I have become so much better at everything I do and have set my bar so much higher and my goals have changed because of the people that I surrounded myself with. That translates not only to co-working spaces but also now with Creative Mornings. The first time I met most of the hosts at our first organizer summit my heart nearly exploded, because I realized these people are making me better. These people have incredible values and the goodness they put into the world made me raise my bar yet again for who I am and what I want to achieve in my life. I know that sounds a little cheesy, but I have two kids. If I want to teach them something it’s that they have to be really, really thoughtful with who they surround themselves with at any time in their life. Stewart: Creative Mornings has become somewhat of a phenomenon. It’s a true global community now with chapters in 160 cities worldwide. How do you approach growing and spreading something that’s just as much of an idea as it is a business? Confidence is impressive and enthusiasm is contagious. Tina: The only answer I can come up with is that my secret superpower is enthusiasm. When I’m excited about something, I will just light up a room with my giddiness and excitement around it in a way that is very contagious. Other people then say, well, you could do the same thing with being confident about something, but I don’t believe that because I feel like confidence is impressive and enthusiasm is contagious. It’s the latter that spreads. With Creative Mornings, I rented for two years in New York City never thinking about growing it, but by me talking about it on my blog and sharing the talks, people wanted that in their life and started asking me about running it. Stewart: I did it in San Francisco for two years and it was an incredible experience. It was interesting how that enthusiasm translated across different countries, different territories, different cultures – everybody was getting excited about the same things. That’s not something I had really experienced before. Global excitement and global community, everybody feels like a part of this movement of generosity. We need more of that type of thing. Tina: More than ever, the world needs really safe places for people to get together and find their like-minded community. 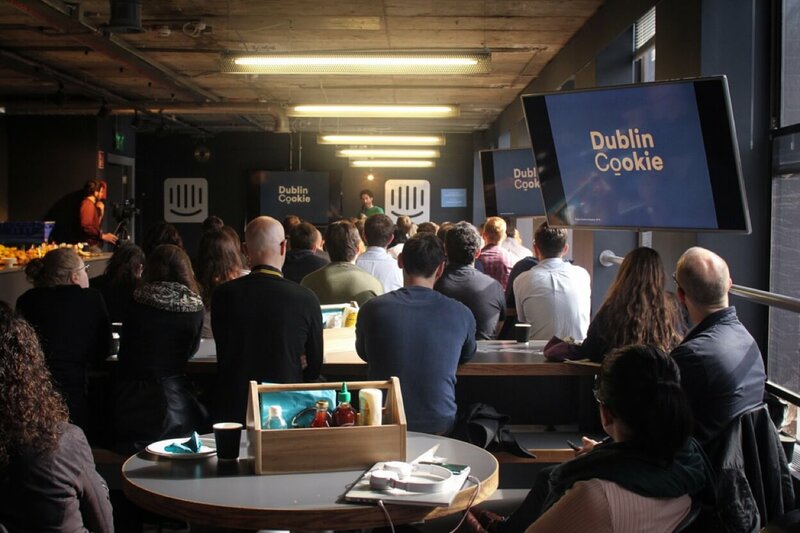 A recent Creative Mornings event hosted at Intercom’s Dublin office. Stewart: When I was doing Creative Mornings it was technically my side project. And as with a lot of side projects and things that you’re really passionate about, it ended up taking up more and more time. Side projects are obviously a huge part of your story and that’s true of many founders today. What’s your advice for balancing those projects with the other responsibilities like a day job or family commitments? How do you avoid getting burnt out? Tina: It’s always a hard question, because at the end of the day, for me, life is one. When I hear people talk about their work and then their personal life, there’s a clear distinction. I was very lucky that I found that sweet spot where what I did for a living I also didn’t mind doing in my personal life. It was all just one. There wasn’t a fear of burning out because I loved what I did so much that it fueled me. I didn’t dread any of the work I’ve done. When you’re a graphic designer, you have an advantage to starting side projects, even when they look like a business. I’m veering off from your question right now, but this reminds me of the second day I was in business with Tattly. Again, Tattly was just a side project with illustrator friends to sell temporary tattoos, and we launched with 16 designs of some well-renowned names like Julia Rothman and Jessica Hische. The second day, the Tate Modern shop buyer called and said, “How long have you been in business? You have such a great brand.” I was sitting there thinking, my God, we’re two days old. Just because I was a graphic designer I was able to make it look professional right out of the gate. Stewart: That was day two, but where does most of your involvement lie today? Who’ve you been hiring? How have you set about structuring that team? Tina: At Tattly, we’re 12 people full-time and then we have about four helpers. We work out of our space in Brooklyn and ship all around the world. We do custom, we sell to stores, we sell directly, and I would never have believed that running a company like Tattly would need so much manpower. Shipping things around the world is really hard, and even though our product is very easy to ship, there’s a steep learning curve. My main involvement is in the role of CEO to make sure there’s enough money in the bank and help with the overall vision of where we’re heading. I’m also heavily involved with the overall creative direction and the picking and choosing of new art and new artists who we take on the roster. Stewart: Was that the intention from day one, to empower your employees and let them fulfill their full potential, and bring their skills and experience to the table? My personal definition of success is the growth I see around me. Tina: Yeah, that’s just how I run companies. I’m not someone who breathes down someone else’s neck. Also, because I bootstrapped Tattly, I always hired very young people that were full of enthusiasm and loved the idea. Seeing the young people grow and learn, that is my currency. My personal definition of success is the growth I see around me. There are some young people that have worked for me who have moved on to other companies and seeing them flourish in their careers is the best thing ever. I can’t wait until I’m an old lady and I sit in my rocking chair on some porch and get emails from the super successful people that once started out as a junior designer with me. Stewart: You’re a mother of two amazing kids. We talked about juggling various types of responsibilities. How do you feel your children have potentially impacted your career? Tina: That is a topic that is so dear to my heart. I took inventory of my life when I became pregnant with my daughter, who’s now 10. For some reason, this whole pregnancy thing really made me think about the dreams in my life that I had and things I still want to accomplish and where I was. One big dream I always had was to run my own design studio, and I did the slightly crazy thing to start it the day she was born. It was fascinating to see the universe unleashed itself on me. The MOMA was my first client. All the signs I got were like, “go, go, go, Tina”. And because I had a husband that was very supportive in balancing the responsibilities of raising a child, it worked well for me. I knew that I needed to work in order to also be a happy mom. I grew up with a mom that ran her own business, so I always knew I wanted to work, but running my own studio was really what put it to the next level, and I loved everything about it. When I got pregnant with my son, I took inventory again. This was three and a half years later, with me running my own design studio. I realized I didn’t want to have my own clients because I actually really didn’t enjoy the service industry. I’m not thick skinned enough, and I really hate disappointing clients. I went on a one-year client sabbatical, and that was possible because I ran a very popular design blog that had some passive income. In that year of magical thinking, I was able to start all these other projects that then became businesses. My daughter turned 10 in April of 2016, and it was an incredibly emotional day for me because I looked back at the decade of changes and a career path that she has completely triggered. Everything I have accomplished that makes me really, really happy – my career has really happened from the day that she was born. I always want to tell women that if you have the right partner who is helpful, having children is not the end of the career. It’s actually the opposite. They were the catalysts in pushing myself to work better and smarter and work on my own projects. It always makes me happy when I hear other women not look at having children as the end of their career or having to step back professionally because there is a way that to make it work. Stewart: What’s next? What’s on the radar for the next year or so? Tina: I have to make sure I’m not dropping any balls. The one thing I miss, if I’m very honest, is the lightness of when I started out all of these projects, because I started all of them around the same time. In the beginning, when you start side projects, it’s just play. There’s not a lot of stakes. 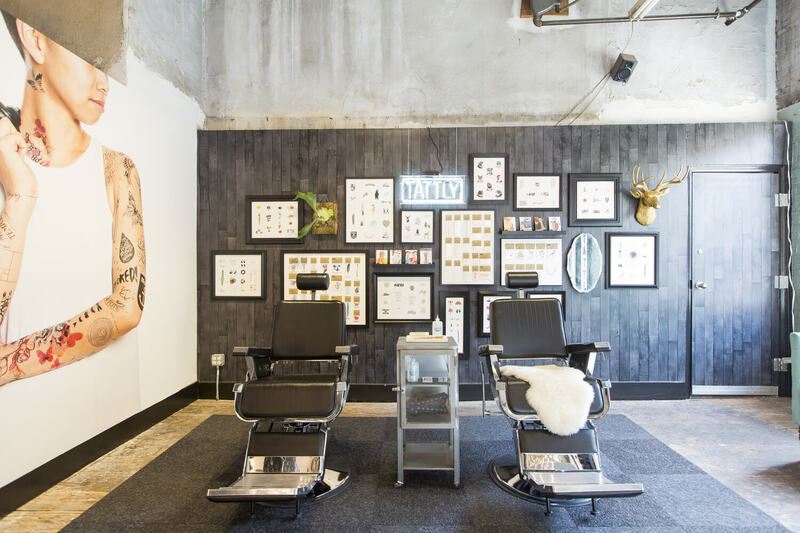 Creative Mornings has six employees and Tattly is 16. There’s a lot at stake if I make a mistake, if I make a wrong decision, if the business doesn’t grow the way it should. Sometimes I look back and I wish for the lighter days, but at the same time, I’m incredibly blessed to work with such smart people and run companies that make the world, in some way, a little better and a little more creative. Stewart: Thank you so much, Tina. We appreciate your time today. We wish you and your many endeavors all of the best. Tina: Thank you for having me.